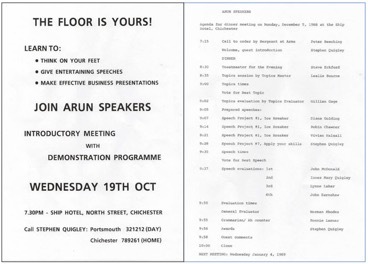 Arun Speakers – 30 years of success! Posted on 27th January 2019 by Seema Menon in Division H, Updates & Posts | Comments Off on Arun Speakers – 30 years of success! Arun Speakers Club was formed in late 1988. Its first demonstration meeting was held on October 19thwith Club Founder Stephen Quigley taking the helm and supported by experienced toastmasters from Maidenhead Speakers, Oxford Speakers and Thame Speakers clubs including two Past District Governors, Norman Rhodes and John Ernshaw. The meeting was a great success and Arun Speakers was officially launched with its inaugural meeting on December 5th. The agenda below includes Robin Chawner’s Ice Breaker speech. Robin has had a distinguished career in Toastmasters and was one of the first DTMs at Arun Speakers. He is our longest serving member making him the grandfather of the club. Arun Speakers achieved its Charter in March 1989. As we approach the 30thAnniversary of our charter it is interesting to look back at the achievements of the club, both in terms of Toastmasters but also the wider impact that the club has had. The club organised the May 2007 District Conference in Portsmouth – The Victory Conference – one of the District’s most successful events. The core team was Andy Hammond (Conference Director), Robin Chawner, Lesley Wells and Mandy Wallace, supported by many volunteers from Arun and neighbouring clubs. In October 2010 a group of toastmasters from Arun Speakers and Solent Speakers began a relationship with the local Princes Trust programme in Portsmouth. The 12 week programme, provides an opportunity for 16 to 25 year olds out of work, training or education, to learn new skills, build confidence, and discover areas of employment or training that may be of interest to them in the future. Our role as toastmasters has been to provide two workshops each term since 2010, to help the students, build confidence with speaking skills and prepare a speech for their final graduation ceremony. This community outreach, has enabled local toastmasters club members (which in more recent years has included Spinnaker Speakers) to enjoy offering support in a collaborative way to young people, who are searching for purpose, confidence, and an opportunity to find a voice and share their story. The Princes Trust are enthusiastic to receive the support. The student’s final presentation speeches share their life changing experience on the programme and are often humbling and always inspirational! As a toastmaster it is a special time to offer back into the community some of the skills and confidence that our local clubs have offered us. People with a stammer have a greatly exaggerated fear of public speaking. But those of us fortunate enough to find the McGuire programme (or similar) have gained a new-found control of our speech, and Toastmasters provides the perfect opportunity to acquire new speaking skills. Many graduates of the McGuire programme have benefitted from belonging to Arun Speakers, indeed three of us have been honoured to serve as President, and we have won club and area contests. The McGuire programme and Toastmasters share many characteristics, including constructive encouragement and support, which help members to achieve what had previously been thought of as impossible. Talking his way to the top! Arun Speakers is proud to be the home club of the current District Director, Andy Hammond – the first Arun Member to fill the role. Andy first visited Arun Speakers late in 2000 and joined early in 2001. He quickly became involved in the club committee after being persuaded to take on the role of VP Education in July 2001. His willingness to say “yes” whenever asked to serve saw him take on the roles of Area Governor in 2004 and then Division Governor in 2005. Having experienced the excitement of District Conferences, and always willing to take on new challenges, he volunteered to take on the role of Conference Director for the Victory Conference in Portsmouth in 2007. During this time Andy was working at West Sussex County Council and was frustrated that he hadn’t managed to get any members from there to join Arun Speakers. His solution was to start a club at the Council and in 2009 founded County Communicators, with great support from Arun’s members. After taking early retirement in 2014, Andy was ready for even more challenges, and became a Pathways Ambassador in 2015, and then Chief Ambassador in 2016. He joined the District Leadership Team as Club Growth Director the same year and was elected Program Quality Director in 2017. Andy is still inspired by seeing how Toastmasters members develop and grow in confidence, and his maxim for his year as District Director is – “changing lives, one speech at a time”. Our short retrospective shows how much can be achieved at a Toastmasters club. Not only creating that safe space for the personal development that comes from all those prepared speeches and meeting roles. But also the opportunity to take those skills back into our local communities and help each other find our voices. Arun Speakers has been a great success long may it continue to thrive.